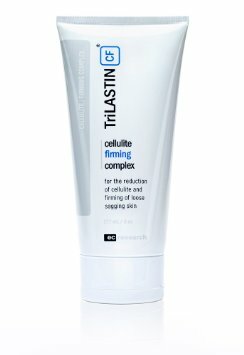 TriLASTIN claims that their cellulite firming complex cream helps to reduce the appearance of cellulite by smoothing the skin as well as lifting and firming the skin. It does this by replacing loose, cellulite skin with firmer tissue. This also assists in preventing cellulite from reforming. TriLASTIN offers a 100% guarantee on their USA made product as well. water, cetearyl alcohol, glycerin, cyclopentasiloxane, ppg-3 benzyl ether myristate, caprylic/capric triglyceride, butylene glycol, ethylhexyl palmitate, polysorbate 20, behenyl alcohol, glyceryl stearate, octyldodecanol, ascorbyl palmitate, arginine, retinyl palmitate, salicylic acid, chlorella vulgaris extract, tocopheryl acetate, citrus medica limonum peel oil, citrus grandis peel oil, zingiber, officinale root oil, juniperus communis fruit oil, centella asiatica extract, macadamia ternifolia, seed oil, zea mays oil, helianthus annus seed oil, beta-carotene, caffeine, glycine, alanine, proline, serine, threonine, lysine, glaucine, hydrolyzed collagen, beeswax, sorbitol, esculin, carnitine, lecithin, dimethicone, atelocollagen, ubiquinone, palmitic acid, betaine, thioctic acid, phytonadione, glutamic acid, polyacrylamide, c13-14 isoparaffin, laureth-7, coco-glucoside, propylene glycol alginate, glyceryl stearate citrate, caprylyl glycol, sodium chondroitin sulfate, acacia senegal gum, disodium ethylene dicocamide peg-15 disulfate, phenoxyethanol, chlorphenesin, polyglyceryl 3, methylglucose distearate, polymethyl methacrylate, sodium pca, methylparaben, propylparaben, tetradibutyl pentaerithrityl hydroxyhydrocinnamate, carbomer, alcohol, xanthan gum, disodium edta. The development of TriLASTIN comes from a company located in PA called EC Research. While this is not a well-known company, such as Revitol, they do provide us with a product that they claim is guaranteed to work on reducing cellulite. This anti-cellulite cream accomplishes that goal by smoothing and toning the skin, which we did find evidence in the ingredient list that the product will in fact follow through on that promise. More ingredients on the extensive list have been proven to help increase the metabolism as well as assist the body in burning fat at a faster rate. While we would have preferred to see more reviews from customers that have actually tried the product, and the company is not well-known, that is not saying that this product is not effective. The ingredient list alone tells us that this product can assist customers in reducing the appearance of cellulite and help to both smooth and tone the loose skin that often results in cellulite. This product is a bit more on the expensive side, but with results seen in as little as three weeks and a money back guarantee, you may simply be getting what you pay for.